Wondering what to bring on your cruise? If you’re old enough to go on the trip, then we’ll assume you know to pack your swimsuit, socks, and underwear for your next cruise. We won’t rehash that you should pack obvious items like t-shirts and shorts for a trip to the Caribbean. But what else should you bring? There are a lot of things that most people wouldn’t think to pack that can be extremely useful on your cruise. That’s because cruising is a little different from any other vacation. Most other places you aren’t in a room on a moving vessel for a week at a time — miles away from the nearest store. That’s why cruising requires you to plan ahead and bring everything you might need. While we typically tell people to pack light, there’s no shame in being prepared for anything on your trip. To help you out, we’ve rounded up a list of nearly 40 useful items that answer what you need to take on your cruise. Many of these you’d never think about packing. We love bringing along a fan to keep us company in the cabin. Not only does it help to have some air circulating in the room, but we also have to have white noise to drown out any sounds while we sleep. For about $20 on Amazon, this model has two speed settings and will fit on a nightstand. One important tip — no matter which sort of fan you bring, you want something compact. Remember that you’re going to have to lug it to the ship and back home. Have an iPhone? What about a tablet or a laptop? A small fan? A nightlight, curling iron or straightener? 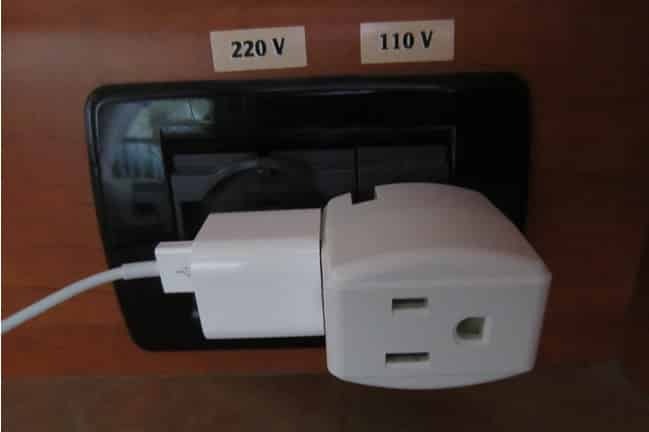 You can see that outlet space can be at a premium in a small cruise cabin. That’s why we recommend packing an adapter or two that will expand the number of plugs. You can pick a two-pack for just around $12 on Amazon. Just be sure it doesn’t have a surge protector, which aren’t allowed on the ship. You can read our full review of the plug shown above here. You likely already have a suitcase or a duffel bag to pack your clothes in, but it’s a good idea to switch over to a 4-wheel spinner suitcase. The walkway from the cruise terminal to your cabin can be pretty long. There are often stairs, inclined walkways, and thresholds to pass. Having a traditional rolling bag gets caught up in your feet and takes up a lot of space when dragging it behind you. A 4-wheeled suitcase like this one can be right at your side and is also much easier to navigate down narrow cruise ship hallways. Nothing beats sitting out on the balcony of the ship, watching the stars and sipping a glass of your favorite vino. The good news is that most cruise lines allow you to bring a bottle of wine or champagne along with you (sorry, beer and booze aren’t allowed). Considering the prices on the ship, passengers should take advantage and bring as much as their cruise line allows. It can save you considerable money and trips to the bar. We’ve all done the dance when we want to open a bottle of wine and search frantically for a corkscrew. If you can’t find one, it usually ends up with you cutting out the cork… and spitting out bits of cork every time you take a sip. So be sure to pack a corkscrew with your wine. A $2 purchase can save you a lot of headache. If you bring a bottle of wine, then you should always pack it in your carry-on. This way you don’t have to worry about it breaking, leaking through your clothes for the week, and possibly getting on other people’s luggage. Still, it’s a good idea to protect those fragile bottles, even in your carry-on. A leakproof bottle protector offers some protection so you don’t have to worry about accidental breaking. The cabins on a ship can get dark — especially if you’ve booked an interior room that doesn’t have windows. So what happens if you get up to go to the bathroom while trying to navigate a small, unfamiliar cabin with furniture? Your shins pay the price. We like to pack along a glowing nightlight like the ones above to give us a little something to see by. The lights shown here cost about $10 for two on Amazon. It’s been said that the key to a happy marriage is a bathroom fan. Unfortunately cruise ships don’t offer fan vents and the cabin is pretty small. If you have a balcony then you have a source of fresh air. Otherwise, you might want some Poo-Pourri to help mask bathroom odors. This stuff doesn’t go in the air. You spray the toilet water before you go and it creates a seal on the surface that keeps odors away. People who use it swear by it. Let’s be clear. You shouldn’t bring enough shoes to fill up an entire shoe organizer. However, they serve more than one purpose. Hang it over the bathroom door and you have a perfect place to put small items like deodorant, shampoo bottles, sunscreen bottles, and anything else. This way you don’t have to take up valuable counter space in the small ship bathrooms. You can find them for less than $10 on Amazon. If you want to spend any time on the beach, then you have to get this beach blanket. Its micofiber cloth means that it packs up small and light — saving valuable space. What we like most is the size. It’s so much larger than simply laying down a couple of pool towels to keep you off the sand. It also only costs about $25 on Amazon. Just a friendly reminder. You should go ahead and put the charger in your suitcase now. It’s too easy to forget. Sticky notes? On a cruise? Don’t laugh. They are awesome for leaving little notes in the cabin for your family to let them know where you are. You can also use them to write notes to the cabin steward should something need attention while cleaning the room. No need to bring hundreds, but a dozen sticky notes come in handy every cruise. Bringing resealable Ziploc bags is one of the smartest things you can do. From keeping your phone/wallet dry while your swim to keeping wet clothes separate from your dry luggage, Ziplocs are worth their weight in gold. Bring a handful and know that your covered for anything you might encounter. Ok, most people know to pack a pair of flip-flops on their trip. We just couldn’t pass up sharing these Reef sandals with the quilted top. They look like they would be the most comfortable flip-flops ever and the textured bottoms are perfect for walking around on slippery poolside decks. Best of all, the reviews for them are outstanding. One more thing — if your current sandals have a sole that’s rubbed smooth, throw them away. You want to have some grip to avoid slips. Want to get a look under the water? We don’t blame you. It’s a completely different world under there and the beauty of snorkeling in tropical waters shouldn’t be missed. And while you can rent gear from most places you’ll visit on your cruise, we’d actually recommend bringing your own equipment. First, paying to rent a mask and snorkel can be expensive — $10 to $15. But as well, you are using something that others have used before, which is a little weird given that the mask and snorkel go right on your face and mouth. This set is around $25 on Amazon and comes in several colors. Remember what we said about the tropical sun? There is no better way to avoid sunburn than to keep the sun off you to begin with. Big hats are always in fashion on a cruise because they protect your face, shoulders and neck from getting sunburned. This lightweight version won’t break the bank (just around $15 on Amazon) and will help keep you cool. We highly recommend something not made of heavy cloth and nothing that’s dark, which can leave your head sweltering. Everyone knows to bring some sandals if you’re headed to the beach, but if you’re going on a cruise then you should also bring some comfy walking shoes. Excursions (or just exploring the port) involves a lot of walking. You don’t want your feet to be uncomfortable while you are on vacation. Already have a pair of shoes? You might want to invest in some insoles to make them like new again. Land ho! Or is it? Believe it or not, there’s a lot to see when you’re out at sea. We love having a pair of binoculars to people watch from afar or simply look at other ships out on the open ocean. An affordable pair won’t set you back that much and you won’t be heartbroken if your kid drops them on the deck. This pair costs less than $30 on Amazon. Think it’s all sun and warm weather if you’re sailing to the Caribbean? Think again. With the ship moving, the wind onboard can be chilly, especially at night. And if it rains? Things cool off dramatically. This is to say nothing of the air-conditioned places on the ship like the theater can can be downright cold. Pack a jacket or a hoodie just in case. The one shown above is about $80 on Amazon and is plenty to keep you warm while sailing at night. How do you pack Netflix? To be sure, cruise lines don’t like you streaming video services and Internet is expensive on the ships. But Netflix allows you to download many episodes to your computer or tablet beforehand so you can watch without having to have Internet connection. Having a few episodes to binge on a cruise is one of our guilty pleasures. It’s also a great way to keep kids entertained if they are bored. Sure, you know to bring your passport. But it’s a good idea to bring a copy of the front page of your passport as well. Then, when you head into port you can lock your passport in your cabin safe and keep the copy with you. You’ll have identification without risking your passport being stolen or lost while in port. Lanyards come in handy for putting your room key/ship’s car at easy reach. Considering that you use this card for everything — opening your room, playing in the casino, ordering drinks — you always have to fish it out of your pocket or purse. With a lanyard like this one, it’s right around your neck making it easy to reach. You may not realize how powerful the Caribbean sun is until it’s too late. That’s why you should pack plenty of sunscreen. Amazon offers up cheap sunscreen, but you can also find deals at your local supermarket. Everyone knows it’s a good to bring sunscreen (unless you like looking like a lobster), but many people never think to bring aloe in case you get burned anyway. The lower latitudes of the Caribbean mean the sun is much stronger than you’re likely used to. Being able to prevent and treat sunburn is important to enjoying your cruise. Grab a bottle of aloe gel to bring on your cruise. These days, almost all of us check our phones for the time. But when you are on the ship or in port, it’s often easier just to keep your phone in the cabin safe and carry a cheap wristwatch. This one is only around $15 and is water resistant (a must on a cruise). Even at the beach, you don’t want to walk indoors flaunting what your mother gave you in a swimsuit. Be sure to bring along a cover up that you can slip over your outfit to add a little modesty. Best of all, you don’t have to worry about big wet spots on your clothes if you use a cover instead of putting shorts and a tank top over your outfit. And you can find them for about $10 on Amazon. We recently reviewed three different bags and this one by Freegrace was the clear winner while costing only about $20 on Amazon. With the fears spreading about the Zika virus, you should definitely take the precaution to bring mosquito repellent. You won’t need it while the ship is sailing (there aren’t mosquitoes in the middle of the ocean), but when you are in port, be sure to apply it as often as sunscreen to keep from getting bitten. The good stuff is a bit pricey. You can usually find it for about $9 a bottle on Amazon. Most cruises will have some seasickness medication our for passengers to take when the waves get rough. You will still likely want to bring your own. It’s only a few bucks and can keep you from feeling bad if the ocean picks up. Like a cellphone charger, you know to bring your shades on a cruise. The only problem is that it’s so easy to forget them at home or in the car. With the reflection of the sun off the ship and the water, having sunglasses is a must. Get you an extra pair for your trip and put them in your luggage immediately so that you don’t have to worry about forgetting them later. Worst case, you’ll have a backup pair on your cruise. Whether you are hanging by the pool or don’t want to leave your valuables on the beach while taking a dip, a waterproof case is a must-have. Use it to keep your phone, wallet, keys, and anything else dry as a bone so you don’t have to worry just because you want to go swimming. You can get two bags for around $20 on Amazon. One of our pastimes on the ship is to watch people struggle with laying their towel on their beach chair. With the ship constantly in motion, there is always a breeze on deck. Bringing a few clips like these can help keep your towel secure to your lounge chair and save you some stress. These costs less than $10 for a pack of 8. Cabins don’t have clocks. And while most people want to leave the alarm clock at home, we suggest bringing one. Not only will it make sure you don’t miss any onboard activities, but it can also help you pack in the most into your days in port. If you’re the sort of person who likes getting up early to be the first off the ship, then this $25 alarm clock is worth its weight in gold. If you’re worried about wrinkles when you unpack your clothes, then this spray is just the thing. Now you don’t have to worry about getting out the iron on your vacation. Simply spray the wrinkled item, hang it in the closet and let the spray do the work. Comes in a small bottle so you can pack it with you even if you have to fly to your cruise port. We like that it only costs around $7 on Amazon. Want the convenience of a fanny pack without the bulk? This stylish belt comes in a ton of colors and sits flat against your body. Put in your passport, cash, cell phone and more, so they are always at an arm’s reach, but safe from pickpockets. In other words, an investment of less than $12 on Amazon can give you peace of mind. We don’t usually carry cash with us on a day-to-day basis. Credit cards are accepted everywhere here at home. However, on a cruise we make sure to pack enough cash to get us through the trip. using cash is more secure than using your credit card in questionable stores, plus credit cards aren’t accepted everywhere like they are back home. You can read our article here to figure out how much cash to bring with you. Whether you are hanging out around the ship or heading into a port of call, it’s always nice to have a refillable bottle with you. This way you can always have some water nearby instead of having to find a restaurant to get a drink. We have used this one from Hydro Flask and loved it for our cruise. You can read our full review here. No, luggage locks won’t keep your things safe if a thief really wants into your bag. But they do make it tougher to get in, taking away crimes of opportunity. For just a few bucks you can keep your bag locked closed with these locks and keep any fast hands from getting your valuables. One lock is about $8 on Amazon, but you can get a better deal buying multiples. I thought I would see Chap Stick on the list with the wind and the sun, but no one has mentioned this tiny little life saver!! That’s a great idea! The wind on the ship quickly dries out your lips. Chapstick is a must-have. Another reason you need a watch: ships operate on “ship’s time,” which may or may not be the time your longitude-sensitive (local time) phone may give you. If you rely on your cell for time, you may be back to the ship an hour early (bummer) or an hour late (real big bummer). This is 100% correct… especially the real big bummer part! You can also set your phone NOT to change based on the local time. Do not forget constipation and diarrhea pills. God forbid you would need them, but if you do, you need to have them. Also pocket sanitizer bottles–those little bottles of purell. use it each and every time you get done with a menu, or after touching handrails in a stairway. Washing is better–but not always convenient. A small extra battery for your e-reader is a good idea too. What about a battery charger for those rechargeable batteries. A torch for when you are walking in darkened areas. Also, tablets for sea-sickness even if you think you don’t need them!! You just never know. Not on the list is a camera! I want to get a new camera that’s good quality and water proof. What is a good quality brand and model? Check out the Panasonic Lumix line of cameras; tough and waterproof. There is a safe in the cabin where we put all our valuables. It’s big enough to put our tablets. So unless you bring a laptop or something big, there’s really no need to get a lock for your suite case. We keep all our valuables in our carry on so they are never out of our possession. We don’t agree with that. We don’t like the idea of luggage being out of our sight and not secured in someway — even if we carry all valuables with us. We always take a beach lock bag to attach to beach chair, to protect our keys etc while we go into beach. Thank you for suggesting that you should pack a small portable fan for your cabin on the cruise. My husband and I are thinking of going on a cruise and I want to find the best one. I’ll have to do some research and find something we will both love. Another thing that is a must for people wearing glasses is a small eyeglass repair kit which can be bought at the dollar store. A screw came out of my glasses while I was going through security. I need them to see. I did not have one and no one else did. Guest services took them and told me they would see what they could do. Who else but the Captain had a kit and fixed them for me. What a life saver. Will not travel without one now! That’s a great thing to pack! It’s tough when you’re in the middle of the ocean. No easy way to get things like repair kits out there. It is a good idea to bring an extra pair of glasses if you are truly dependent on them.I have been an optician for 40 years and have heard way to many stories about glasses getting lost or destroyed at the most inopportune times. The Alarm Clock only has 4 time zones, “4 US Time Zones Selectable (P/ M/ C/ E)”, not Hawaii or Alaska and nothing if you want to travel internationally and it’s set by radio, so not suggested. Highlighters: To note which activities you wish to do on the cruise agenda. Playing cards / games: To use when you just want to chill but stay active. Ponchos: Depending on your destination. Lanyards: Get your sea pass card punched and attach it to a lanyard around your neck. Lanyards are on the list. How do you get the lanyard punched? Will they do that for you on the ship? Yes, there is usually a table with hole punchers. Our must-have is a pop-up mesh laundry hamper. It packs flat in your bag and is a life saver in keeping the tiny room tidy and keeping your clean clothes fresh and separate from what’s already been worn. I use packing cubes. It saves so much room in my luggage. Once in the room, I unpack on the shelves and hangers and then designate one of my largest packing cubes for dirty laundry that lives on lowest shelf. Once home, it too can go into the washer. I like Marie’s idea. I usually travel with an empty pillow case to put laundry in. Since the ship has a lot of metal use heavy duty magnets with hooks on them. I place them around the cabin to hang things on. Great idea. Definitely a good suggestion. May I emphasis “heavy duty” magnets in Cynthia’s post? The 1st time I just took some cheapies and they slid down the wall one something was attached to them – they weren’t strong enough. With heavy duty magnets I have placed my wrung-out swimsuit on a hanger and hung it from them to finish drying with no problems. There is a retractable clothes line in the bathroom of your cabin, usually in the shower. Happy cruising everyone. I always buy a few rain ponchos from the dollar store prior to traveling so that if we need them, we are not at the mercy of the local gift shops. Another handy thing is to put a few dryer sheets in your suitcase so that it stays fresh smelling. Those are great ideas! Love the dryer sheets idea. With the humidity of being at sea, freshness is always nice. Check out Frog Toggs rain gear. I got a very lightweight rain coat for about $15. It packs down small into a little bag that’s included. The clouds just opened up in Roatan but my wife and I had our rain coats on in seconds. My in-laws were not as prepared. I would have given mine to in ln Laws. Thank you for the info! We’re going on Oasis of the Seas in 5 weeks!!! We always get a balcony room and love the door open. We take a couple bungee cords to hold it open. We also have put something on the outside of our door so we could find it quicker. Also if you put up a light weight chalk board or dry erase board people can leave you notes. Those are both great ideas. The hallways and doors can all look the same on the ship. Are there any rules on how you “attach” things to the doors? Not that we’ve seen. However, it should be something that doesn’t damage the doors. Magnets are ideal or a piece of masking tape. Don’t be surprised if someone adds a comment to your dry board posts. On a recent cruise, the “Grandmas” used a dry board and other passengers added fun comments as replies. All to the enjoyment of grandmas and others. when we go to the beach or think we may need to rest on the ground or seating is dirty I pack a top sheet. they pack well and sand shakes off easily, plus everyone already has at least one so no add’l expense. A fitted sheet works even better. Place water bottles or something similar in the corners to anchor it down with elastic edge up at the top of the bottle (when it is standing. Helps keep sheet in position and sand from blowing onto sheet because it makes a kind of ‘play pen’ shape. I like your suggestion to bring a copy of our passport along with our actual passport so we can keep the actual one safe. My husband and I want to go on a cruise together soon. I think the tips you shared will help everything on the cruise go smoothly!